Covers to Johnny America #8 sit on the drying rack. A cover after the printing run was finished. 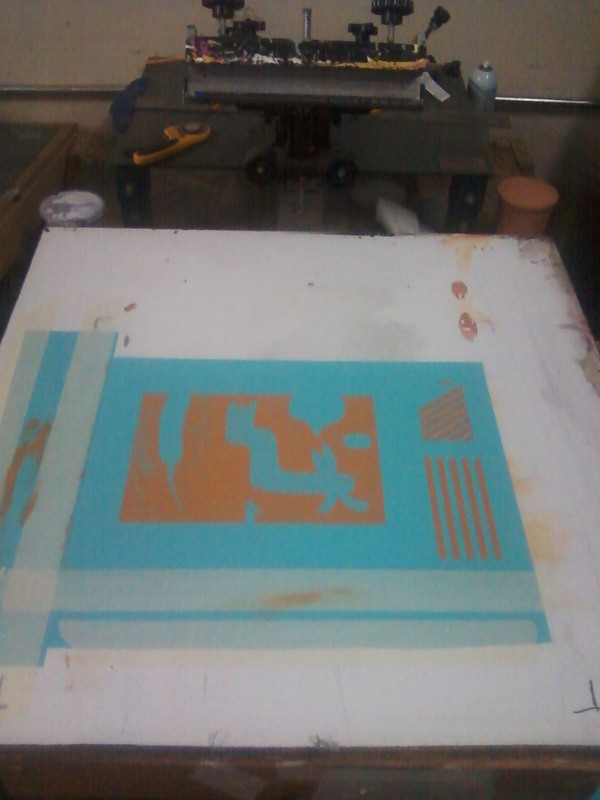 One of my favorite parts of Johnny America is creating the screen-printed cover. The process is fairly laborious but the results are always rewarding, especially when you see the extent of your work filling a drying rack. For issue eight, we used the Blu Raspberry Pop-Tone paper from French Paper. The Tiffany blue color was lovely to see against a butterscotch brown and black. Thanks to Adam Jeffers and Blue Collar Press for their constant help with printing our covers. We’re having two releases for issue eight. The first is at The Bourgeois Pig, a small coffee and cocktail bar in Lawrence, Kansas (6 E. 9th Street, Lawrence, Kansas), this Saturday, Nov. 13. The second release is Saturday, Nov. 20 at the studio of Hammerpress, creators of some of the nation’s finest letterpress ephemera, in the Kansas City Crossroads Arts District (110 Southwest Boulevard, Kansas City, Missouri). These release events are open to the public and we invite you to come!